In 1891, the family lived at Cheapside, Shildon and 58 year old William and his 3 oldest sons all worked as coal miners. 10 year old Thomas was a scholar. By 1901, it is likely that William had died and 20 year old Thomas lived with his mother at Hudson Street, Shildon. Thomas worked in the railway engine shop. Richard Thomas Metcalfe married “Mrs. 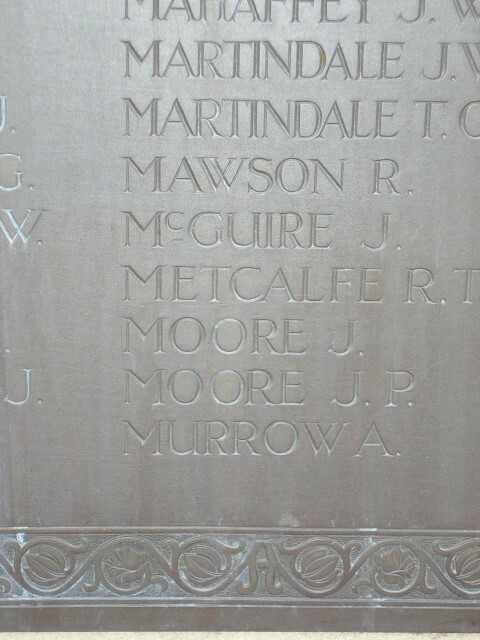 E. Metcalfe” who lived at 4 Jackson’s Row, Woodside, Witton Park, Bishop Auckland. Thomas’ father William was born at Marrick in Yorkshire and presumably moved to Durham in search of work. He worked at pits near Evenwood, West Auckland and Shildon. Thomas did not follow his father into the pits but worked at the railway works, Shildon. By the time of his death, his wife lived at Woodside near Witton Park. 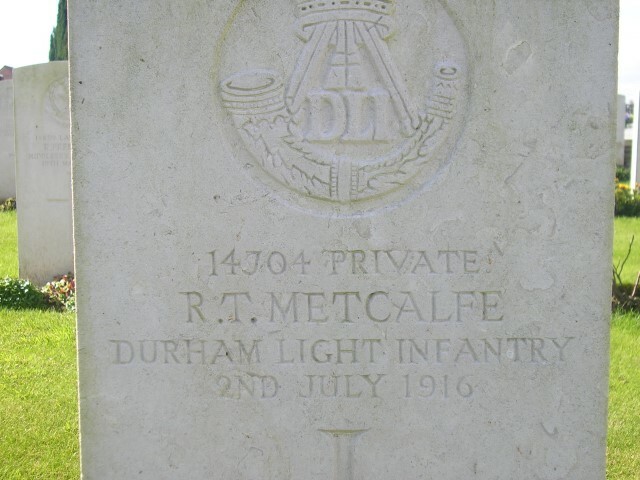 The service details of Private R.T. Metcalfe have not been traced but he enlisted into the DLI being posted to the 15/DLI and was given the regimental number 14704. He enlisted at Bishop Auckland. The Division crossed to France in September 1915 and served with distinction on the Western Front throughout the war. 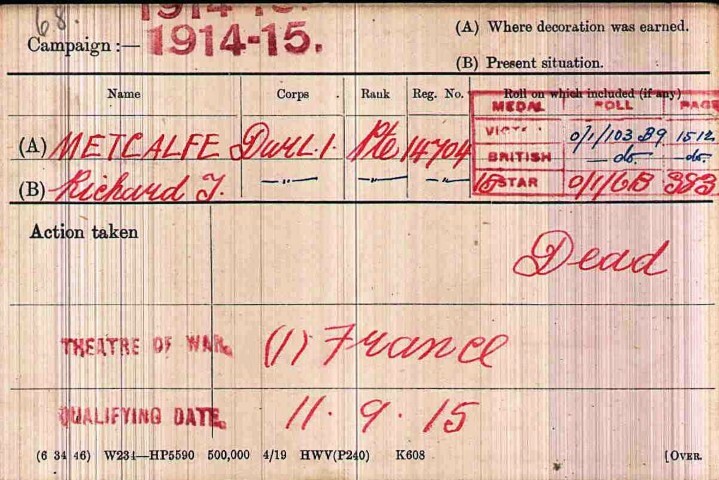 14704 Private Richard Thomas Metcalfe entered France 11 September 1915  with the 21st Division. Its first experience was truly appalling. Having been in France for only a few days and lengthy forced marches brought it into the reserve for the British assault at Loos in September 1915. The Division was sent into action on the second day, the 26th whereupon it suffered heavy casualties for very little gain – there were no less than 450 casualties in the ranks. In popular imagination, the Battle of the Somme has become a byword for military disaster. In the calamitous opening 24 hours the British Army suffered its highest number of casualties in a single day. The loss of great numbers of men from the same towns and villages had a profound impact on those at home. The first day was an abject failure. The following weeks and months of conflict assumed the nature of wearing-down warfare, a war of attrition, by the end of which both the attackers and defenders were totally exhausted. Adverse weather conditions, the autumn rains and early winter sleet and snow turned the battlefield into morass of mud. Such intolerable physical conditions helped bring to an end Allied offensive operations after four and a half months of slaughter. The fighting brought no significant breakthrough. Territorial gain was a strip of land approximately 20 miles wide by 6 miles deep. In terms of casualties, the cost was enormous – British and Commonwealth forces were calculated to have 419,654 casualties (dead, wounded and missing) of which some 131,000 were dead. French casualties amounted to 204,253. German casualties were estimated between 450,000 to 600,000. In the spring of 1917, the German forces fell back to their newly prepared defences, the Hindenburg Line, and there were no further significant engagements in the Somme sector until the Germans mounted their major offensive in March 1918. The XV Corps was under the command of Lt-General Henry Horne. The Division faced the Fricourt and Mametz spurs which ran down from Pozieres Ridge and were separated by Willow stream. The terrain was ideal for defence and the Germans took full advantage. The 2 villages had been converted into fortresses with a supporting trench system and deep dug outs of great complexity. The 21st and 7th Divisions were to overrun both spurs and advance up to the second German line – White Trench to Quadrangle Trench and then consolidate. The village of Fricourt was not to be directly assaulted but pinched out by attacks driving in from either side. Later, the Corps reserve, the 17th Division was to continue the advance through Mametz Wood. Although they were attacking a position that combined natural and man-made defensive strength, one thing in their favour was that in this sector of the front the German artillery had been thoroughly targeted and to some extent silenced. This success rendered the German defences substantially more vulnerable than otherwise would have been the case. The gap between the front lines was also considerably less than many sectors assaulted – narrowing in places to just 100 yards. A further advantage to the assaulting troops was the use of a creeping barrage. On the left, the 21st Division faced the fortress village of Fricourt. They were helped by the detonation of three mines of 25,000lbs, 15,000 lbs and 9,000 lbs under the German lines opposite the small British salient, known as the Tambour, which gave them their collective name. In this case the mines were a pure diversion as the craters were not to be rushed, and it was hoped that the lips thrown up around them would provide an interruption to the deadly flanking fire of the German machine guns. On the left the 64th Brigade, and to a lesser extent the 63rd Brigade, made some considerable progress despite the dangerous irritation of flanking fire from Fricourt itself and La Boisselle on the left. As the leading battalions pushed forward, the support battalions followed hard on their heels. The combination of rattling machine gun fire, whistling rifle bullets and occasional shells was enough to daunt even the bravest. Later that afternoon, the nixed remnants of the assaulting and support battalions tried to push forward from their positions in Crucifix Trench on to Shelter Wood. The result was disastrous. As they went further forward, away from their reserves and the cover of their field artillery, the Germans just grew stronger and ever more threatening. 1 July: 15/DLI was ready to advance behind the 9/KOYLI, who led upon the right. Day broke beautifully fine, and the German reply to our terrific gunfire was of no great strength. At twenty-five minutes past seven the heavy artillery lifted from the German front line, and the eager Yorkshiremen began to climb out of their trenches and advance into the smoke as the shrapnel barrage came down. The Fifteenth followed in their turn, with A and B companies in front. German machine guns-hastily hoisted from deep dug-outs which were little damaged by our hurricane of high explosive-opened on the Durhams, who covered 200 yards of “No Man’s Land” without a pause and entered the shattered German line. Men in field grey came out of the earth and surrendered, but others were fought with bomb or bayonet where they resisted in shell craters and bits of standing trench. So the Fifteenth won their way until they joined the Yorkshiremen in the sunken road and what had been Round Wood upon the left. More prisoners were gathered in the dug-outs under the bank, but the men of the Fifteenth went on over the open and before half-past eight had taken Crucifix Trench, which ran out beyond. The shrapnel barrage moved ahead, but the ground in front was swept by machine-gun fire from the right, where the Germans still held Fricourt, and from the left, where they lay in Birch Tree Wood. The sunken road and Crucifix Trench were put in a state of defence, and in the road at the entrance to one of the dug-outs – now all filled with British and German wounded – headquarters were established. The brigade had gone far ahead of the troops on the flanks, but with Lewis guns in Round Wood and Lozenge Wood all was in readiness for the German counter-attacks which were bound to follow. At twenty minutes to two came orders to try for Shelter Wood, even if the advance were carried no further: but the protective barrage had come down ten minutes before, so that the venture had to be made without artillery support. Fighting patrols went forward to gain what ground they could, and in this advance Capt. D.H.J. Ely, already wounded in the foot, was killed by a German sniper. Pte. J. Jolley spied the slayer as he prepared for a second shot, and British and German fired together. A bullet grazed Jolley’s nose, but he got his man through the head. 2nd Lieuts. F.J. Cartman and A.S. Morley, who had each replaced a fallen company commander, thrust forward with their men until shell holes only 40 yards from the woods were reached. In these positions the Durhams sniped at the enemy as could be seen and, despite repeated attempts to dislodge them, held on until relieved eight hours later. Both officers eventually received the Military Cross. As the afternoon wore on the captured area was heavily shelled, while machine-gun bullets whipped along the sunken road. At five o’clock Germans were seen assembling near Birch Tree Wood, and a party of 300 advanced but were dispersed with heavy loss by Lewis gun fire. While watching this affair Colonel Fitzgerald received a machine-gun bullet in the thigh and was carried to his headquarters. Fourteen hours passed before he could be conveyed to the rear and, though he reached a London hospital, he died there on July 12th. In the evening two companies of the 10th Yorkshire arrived in Crucifix Trench to establish touch with the 63rd Brigade upon the right. It was much later when the Lincolns and Middlesex appeared to take over the positions held by the fifteenth, a long and difficult operation which was not completed till dawn. At six o’clock on the morning of the 2nd parties were still arriving in the original British front line, where the Fifteenth assembled under Major R.B. Johnson. Grievous losses had been suffered. Among the other officers killed were Captains J. East and L.H. Sanger-Davies and Second Lieutenants R.O. Cormack, C.S. Haynes, J.M. Jones and M.L. Huddlestone. Captain F.P. 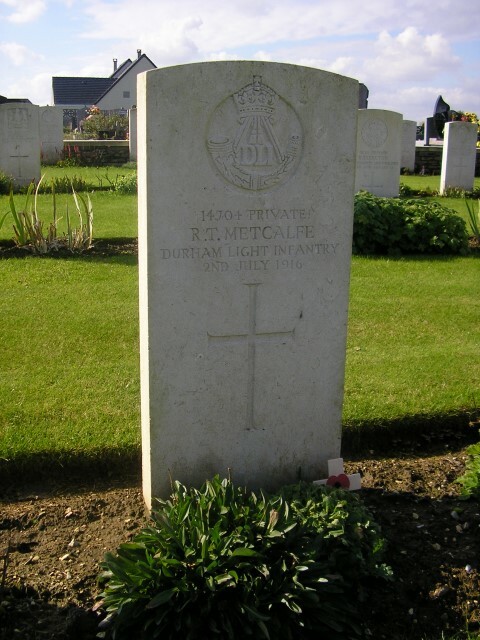 Stamper was among the wounded and casualties in the ranks numbered about 440. Serjeants E. Wilson, T. Jones, Corporals F. Connor, J.B. Lauder and Privates J. Gray, J. Robinson, J.W. Robson, G. Tait and S.S. Dennis were awarded Military Medals. 3 July: 15/DLI carried up water, ammunition and bombs to the 62nd Brigade, who had taken Shelter Wood. The attack of the XV Corps had been far more successful than that of its neighbours to the north. The reason was the far more effective counter-battery work that had preceded the assault. The German artillery was almost quiescent and as the narrower space between the opposing front lines allowed the British troops to get across No Man’s Land correspondingly quicker, they were able to catch the German front-line troops, in some cases before they had emerged from their dugouts. Ironically, the much vaunted artillery experiments with a creeping barrage, which would later provide a partial template for most infantry attacks on the Western Front, was not particularly relevant to their success. The line of bursting shells was too ‘thin’ in that there were insufficient shells bursting and there was a lack of masses of high explosive shells needed to give it a real bite. The over ambitious speed of advance also meant that in reality the line of shells quickly outpaced the struggling infantry, who were left far behind to fend for themselves. But the successes such as they were had come at a cost. The 21st Division suffered 4,256 casualties while the 7th Division lost some 3,380 men. Mericourt-L’Abbe Communal Cemetery Extension: Mericourt-L’Abbe is about 6km south east of Albert on the road to Amiens. In the early summer of 1915, Commonwealth forces relieved French troops on this part of the front and Mericourt-Ribemont station became a railhead. This cemetery was begun in August 1915 and was used chiefly by field ambulances until July 1916. 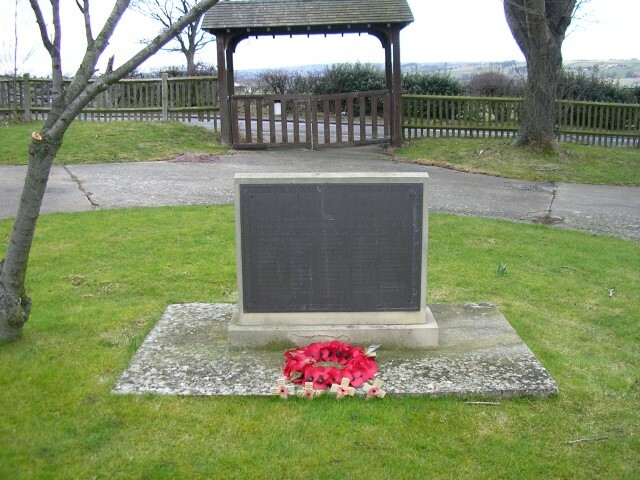 Private Richard Thomas Metcalfe is buried at grave reference I. D. 10.